2 What is the Sri Lankan clay water filter? 3 When did the clay filter originate? 4 What are the CWF components? 6 Why is the CWF attractive to rural Sri Lankans? After the Asian Tsunami of 2004, access to clean water became a major issue for people living on the coast of Sri Lanka. 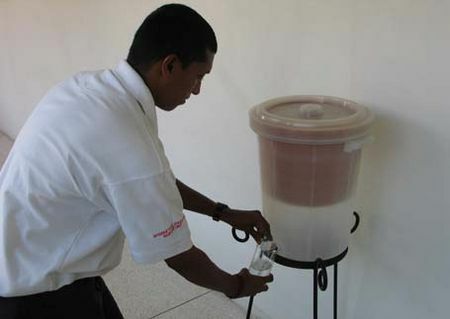 Being aware that one of the UN Millennium Development Goals for 2015 is to “halve the proportion of people without sustainable access to safe drinking water”, the American Red Cross (AmRC) and the Sri Lanka Red Cross Society (SLRCS) collaborated to introduce an appropriate clay water filter (CWF) technology to Sri Lanka. This is a low cost filter that removes diarrhoea-causing bacteria from water to make it safe for human consumption. 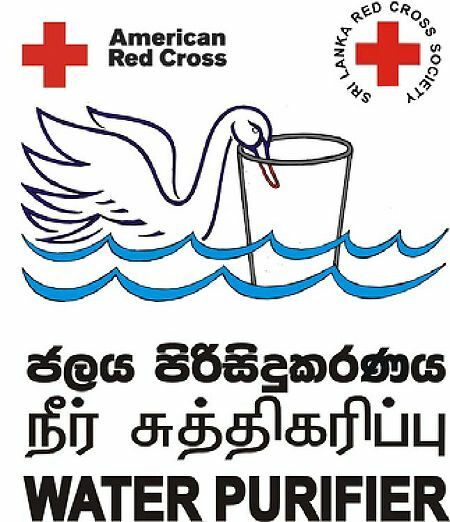 These filters represent a sustainable way for Sri Lankans to get safe “point of use” water and reduce their risk of contracting diarrhoea and waterborne diseases. Improving hygiene practices by deepening the understanding of the transmission of bacteria. Improving local capacity to manage and sustain the CWF production and marketing. The CWF Project was designed primarily to operate in the southern districts of Galle, Matara, and Kalutara for the benefit of Tsunami affected persons. Its accomplishments include the establishment of two production facilities, contracts with local and international component suppliers and capacity building of a cadre of competent project managers and hygiene promoters. 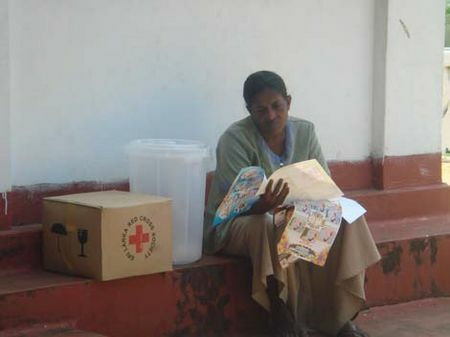 By the middle of 2008, 12,000 CWFs had been distributed free of charge for the benefit of over 60,000 persons. These recipients invested their time attending a hygiene promotion workshop where they were made aware of water-borne diseases and how to prevent them. They also received hands-on training on how to assemble, use and maintain the CWFs.By late 2008 the project had expanded its production capacity and had moved towards the commercialization of the CWFs based on social marketing principles. What is the Sri Lankan clay water filter? The CWF is a household unit for filtering, treating and storing potable water. It consists of a porous clay “pot” suspended in a 20 litre plastic receptacle with a tap located close to the bottom, through which the clean water is drawn. Its operation is straightforward: The plastic lid is removed and the clay pot is filled with water of uncertain quality. This gravity fed water passes slowly through the pores in the sides and bottom of the pot and is collected in the plastic receptacle. During the process, the CWF removes sediment and treats contaminated water to attain quality standards set by the World Health Organisation (WHO). Additionally, as a result of treating the pots with colloidal silver, a second level of protection is provided to kill any bacteria that may have passed through its microscopic pores. 98.00 percent of harmful bacteria and parasites. At an average of two litres per hour the CWF has the capacity to provide over 40 litres of water per day, enough to meet the drinking water needs of most families. When did the clay filter originate? 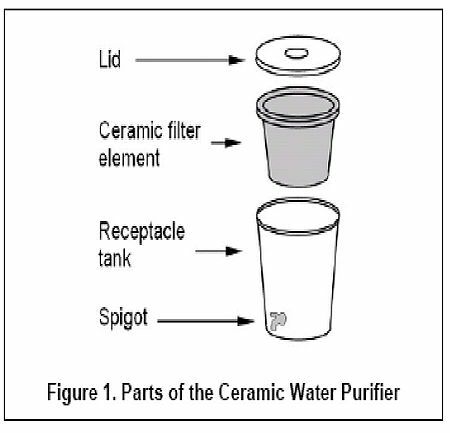 Water filtration for home use with porous clay and sandstone receptacles dates back hundreds of years in both Central America and Asia. 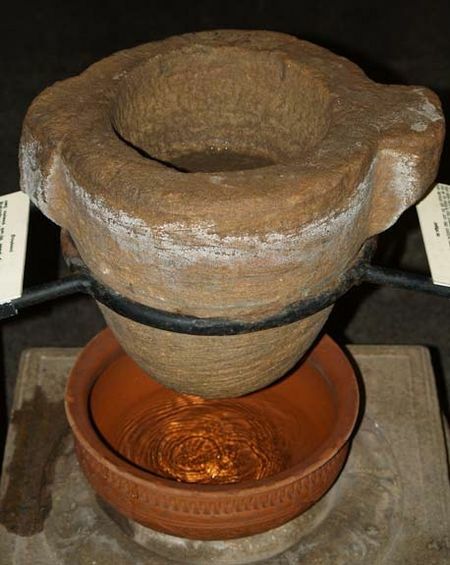 Below is a photograph of a 1,200 year old porous sandstone filter on display at the Sri Lanka National Museum. 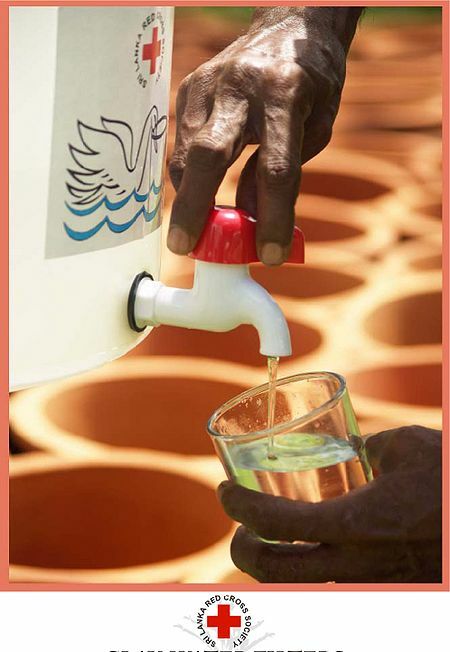 The CWF technology utilised in Sri Lanka was developed in the early eighties in Guatemala and later commercialised by the USA based Potters for Peace Organization (PfP), which saw it as a good response to the clean water needs of persons affected by Hurricane Mitchell. Over the years, several African and Asian countries have adopted the technology and have been marketing them with high levels of community acceptance. PfP reports that up to 20 countries are currently producing CWFs. The CWF has been recognised internationally. 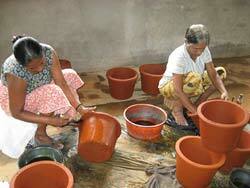 In 2003 the Cambodian Red Cross clay water filter project won a World Bank Development Marketplace award. More recently, in early 2008 IDE was awarded the World Bank’s East Asia Project Innovation Prize for its contribution to sustainable solutions for rural drinking water treatment. 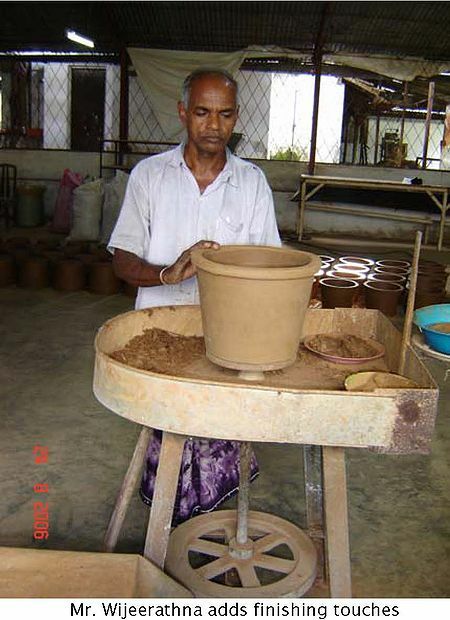 Filter elements or pots are made in Sri Lanka under contract in factories situated in Matara and Kelaniya. Meticulous efforts have been invested in the production systems to ensure consistent product quality from both factories. Water receptacle (or buckets) with lid. These are made by a Kurunegala based producer. The translucent blue colour differentiates CWFs sold on the commercial market from the white ones previously distributed free of charge. Each bucket is branded with the SLRCS logo. A spigot with washers is supplied and instructions are given to ensure its leak-proof assembly to the bucket. Cleaning brush: A cleaning brush is provided with the clay water filter kit so that families can regularly clean them. Usage instructions brochure: These instructions help to educate new users on cleaning and maintenance. 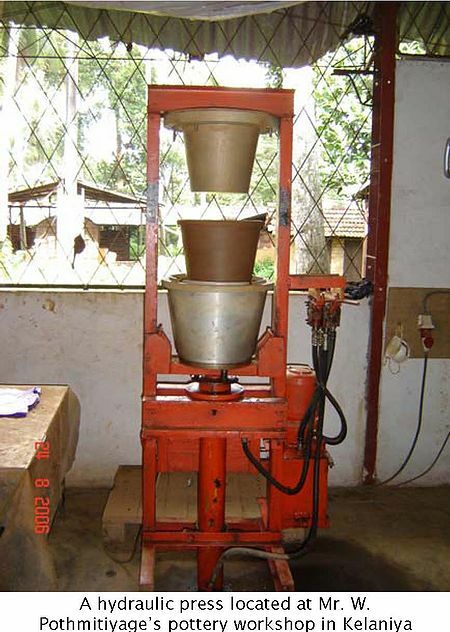 The clay pot production equipment consist of hammer mills, grinders, horizontal mixers, hydraulic presses and other tools that include moulds, sifters and weigh scales. First, the rice husks are ground and made ready for mixing. Second, the husks are mixed with dry clay and water until a homogenous clay sludge is ready. This clay mixture is then shaped into blocks and taken to the press area where hydraulic presses are used to produce the basic pot shape. At this stage the filter element looks much like an oversized plant pot. However, it is much more than that as its rich husk content makes it ideal for filtering contaminated water. These “green” pots need to be air-dried for 8 -12 days depending on the ambient temperature and humidity. The next step in the process is kiln firing. Based on lessons learned from three Cambodian CWF producers, several small kilns were built to ensure the precise control of firing temperatures. The pots are manually loaded and the wood-fuelled kilns are brought to a maximum temperature of 830 °C. During firing, the rice husk particles are completely burnt off, thus creating miniscule pores in the body of the pots. Digital pyrometers and pyrometric cones are used to ensure the correct temperatures and to make any necessary adjustments to the firing process. This key stage in the manufacturing process determines the efficacy of the filter elements. The increased porosity of the clay resulting from the burnt off material determines the water flow rate and the effectiveness of bacteria removal. After a slow cooling process of 10-12 hours, the filters are immersed in a low concentration of colloidal silver solution. This is an anti-bacterial agent that was used extensively in medical practice prior to the development of antibiotics in the 1940s and 50s. The amount of silver leached from the CWF to the filtered water is negligible (far below WHO guidelines for silver concentration in drinking water) and therefore has no effect on users' health. Colloidal silver provides a second level of protection. Quality assurance is emphasized throughout the manufacturing and sales process. These procedures range from the selection of clay and rice husks to flow rate testing, as well as the breaking and inspection of selected pots to assure complete kiln firing. Detailed factory records of the quality assurance tests are kept together with the serial number of each filter, its production and firing dates and the precise filtration rates. Why is the CWF attractive to rural Sri Lankans? The CWF’s advantages include its effectiveness, simplicity, portability and affordability. It is economical and requires no recurrent costs by the user. A CWF can filter from 1 – 3 litres of water per hour, enough to meet the drinking water needs of most families. Made mostly with indigenous materials by local potteries the CWF is more environmentally friendly and affordable than most other household safe water methods as they are locally produced. The CWF Project offers extensive consumer support. After the distribution and hygiene promotion events, project staff visit households twice. On the first visit, approximately one week after distribution, staff observe and give advice on how the CWFs have been assembled and located in the houses. During the second visit, approximately four weeks later, project staff carry out a presence/ absence test utilising a UNICEF approved bottled hydrogen sulphide kit. The samples of test water are kept for 24 hours. The presence of bacteria will cause the sample water to turn black, while clean and therefore safe water will remain colourless. Convenient maintenance of the CWF includes monthly scrubbing of the filter “pot” using a soft brush or cloth to clear clogged pores and washing the plastic receptacle with soapy water to prevent bacterial growth. While CWFs are lightweight and portable, care must be taken during transport and handling to avoid breakage. The CWFs have an average two-year lifespan. This page was last edited on 8 April 2010, at 17:55.